Who should attend the LPG sessions of face endermologie ? The LPG sessions of face endermologie are addressed to the men and women who wish an instant glow (immediate radiance) for an event, FACE AND NECK TREATMENT ANTI-WRINKLE, FIRMNESS, DOUBLE-CHIN, ANTI-CIRCLES (CONCEALER), and ANTI-POCKETS. What areas can be treated by an LPG session of face endermologie ? Here are the areas that can be treated by an LPG session of face endermologie: Forehead, anti-wrinkle eye contour, eye contour against puffiness & dark circles, mouth contour, oval face, double chin, neck, neckline (upper bust), hands. How does an LPG session of face endermologie work? The session begins with a diagnosis of your skin. Then the programs of the machine vary according to the treatment and reproduce the movements of the famous “Backgammon pinch”. These repetitive movements activate the circulatory systems and oxygenate the tissues, and enhance the production of collagen (cell that gives the firmness appearance to the skin), elastin (suppleness) and hyaluronic acid (anti-age hydration). What are the results of an LPG face endermologie session? 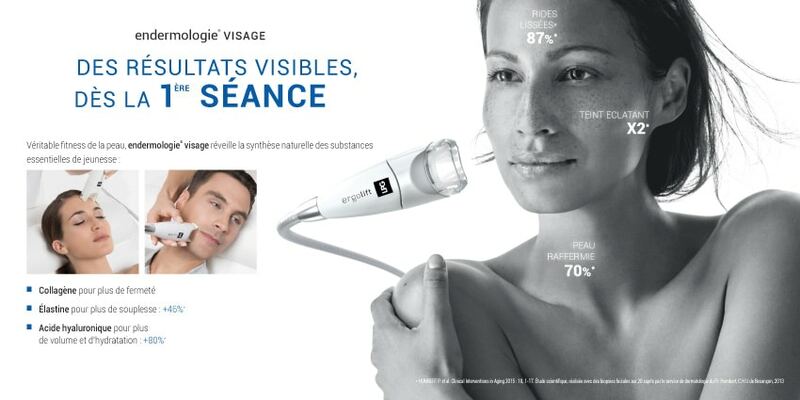 What are the prices for a session and an LPG face endermologie face treatment? Your face endermology® kit is composed of the lift 20 (Face, neck, neckline and bust treatment) and lift 10 (treatment of the eyes contour, lips contour, and hands). It is personal and guarantees perfect hygiene during your sessions face endermology®. Areas: Forehead, anti-wrinkle look, pockets & dark circles, mouth, double chin, oval, neck, cleavage, hands. Harmonizes the volume of the face, restores density to the skin while filling from the inside wrinkles and fine lines. Your face kit or product + 1 session FREE! Your face kit or product + 3 sessions FREE! * Terms of Sale: Each person is different. The results vary from one person to another, and we cannot guarantee results. Cancellation of 7 days for the reimbursement of a cure on unused sessions. After this period, a credit is possible of the value of the unused sessions.